ISTANBUL — The reports are like something out of a distant era of ancient conquests: entire villages emptied, with hundreds taken prisoner, others kept as slaves; the destruction of irreplaceable works of art; a tax on religious minorities, payable in gold. A rampage reminiscent of Tamerlane or Genghis Khan, perhaps, but in reality, according to reports by residents, activist groups and the assailants themselves, a description of the modus operandi of the Islamic State’s self-declared caliphate this week. 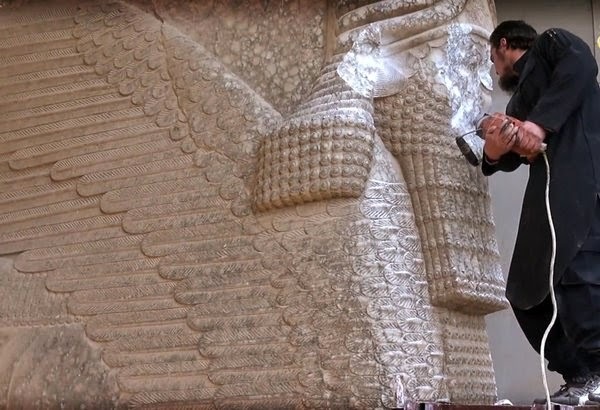 The militants have prosecuted a relentless campaign in Iraq and Syria against what have historically been religiously and ethnically diverse areas with traces of civilizations dating to ancient Mesopotamia. The latest to face the militants’ onslaught are the Assyrian Christians of northeastern Syria, one of the world’s oldest Christian communities, some speaking a modern version of Aramaic, the language of Jesus. The New York Times reporter need not have gone to so distant a past to find parallels to the plight of the Assyrians, as this is merely a repeat of what happened only a hundred years ago. 307 high coverage human Y chrmosome sequences. Paper to be published soon. 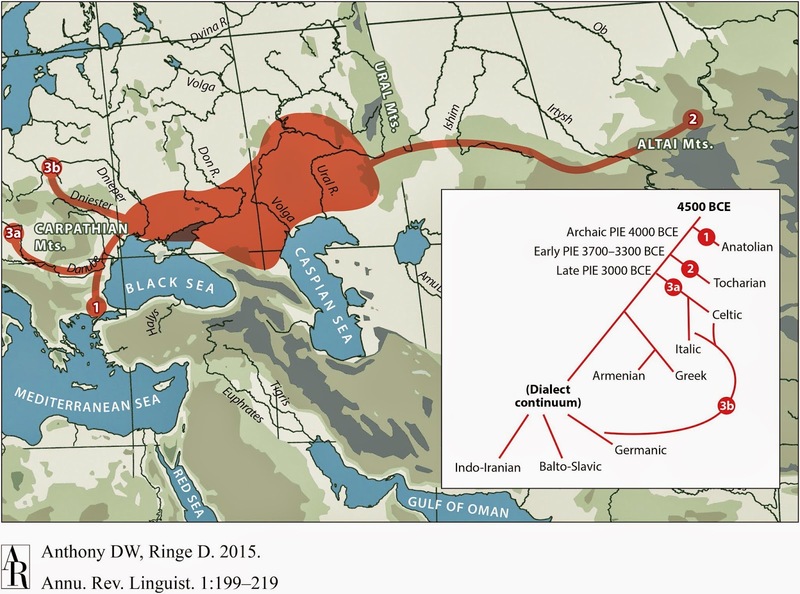 The Genetic Legacy of the Expansion of Turkic-Speaking Nomads Across Eurasia. Paper in press. The Y chromosome data seems particularly exciting (there is a spreadsheet of populations in the download directory). One of the weaknesses of the 1000 Genomes data was that it didn't have any populations between Tuscany and East/South Asia, and the new dataset seems to rectify that. 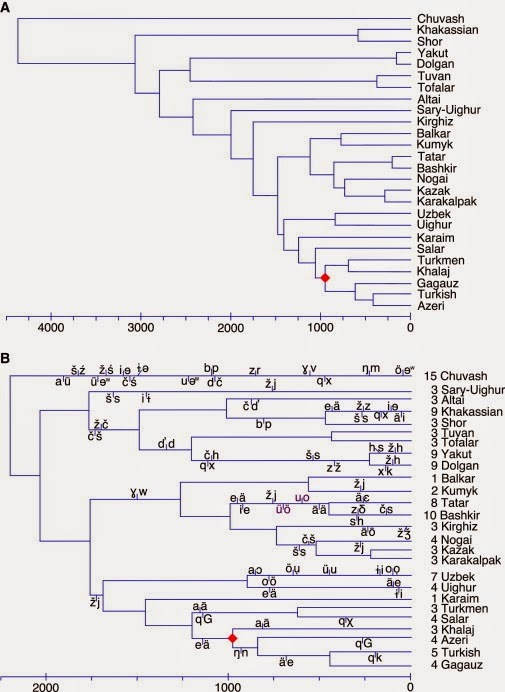 The Turkic dataset is probably the one used for the preprint The Genetic Legacy of the Expansion of Turkic-Speaking Nomads Across Eurasia. Since I overlooked this when it came out last summer, I'll post about it when the paper is published in a journal. KNM-LH 1 and other Pleistocene African specimens, all of which are potentially sampling candidate populations for dispersals across and out of Africa during the Late Pleistocene (12–15, 50, 59), differ substantially not only from recent Africans but also from individuals drawn from Holocene LSA archaeological sites. KNM-LH 1 and other Pleistocene African specimens (found with MSA and LSA artifacts) are also distinct from most EUP individuals. Things are looking good for my Afrasian-Palaeoafrican admixture hypothesis which postulates that modern Africans are a mixture of "Afrasians" (a group of humans that also spilled over into Eurasia and/or back-migrated to Africa) and various groups of very divergent "Palaeoafrican" populations. In the context of this hypothesis, greater African genetic diversity is understood not as the result of a bottleneck of epic proportions during Out-of-Africa, but rather as a result of admixture between the two groups. Christian A. Tryon et al. Kenya National Museums Lukenya Hill Hominid 1 (KNM-LH 1) is a Homo sapiens partial calvaria from site GvJm-22 at Lukenya Hill, Kenya, associated with Later Stone Age (LSA) archaeological deposits. KNM-LH 1 is securely dated to the Late Pleistocene, and samples a time and region important for understanding the origins of modern human diversity. A revised chronology based on 26 accelerator mass spectrometry radiocarbon dates on ostrich eggshells indicates an age range of 23,576–22,887 y B.P. for KNM-LH 1, confirming prior attribution to the Last Glacial Maximum. Additional dates extend the maximum age for archaeological deposits at GvJm-22 to >46,000 y B.P. (>46 kya). These dates are consistent with new analyses identifying both Middle Stone Age and LSA lithic technologies at the site, making GvJm-22 a rare eastern African record of major human behavioral shifts during the Late Pleistocene. 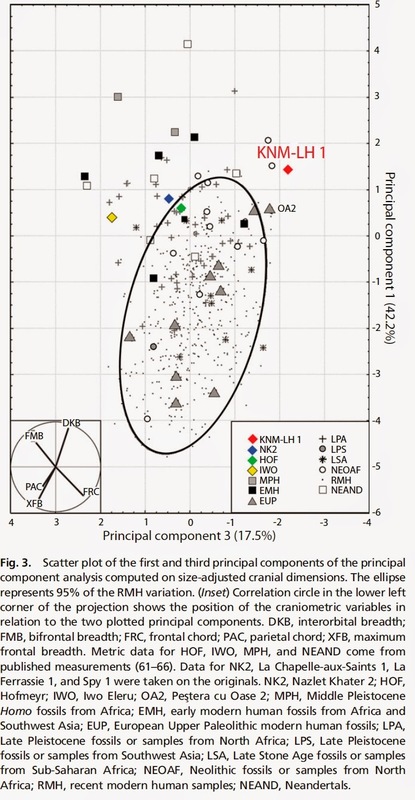 Comparative morphometric analyses of the KNM-LH 1 cranium document the temporal and spatial complexity of early modern human morphological variability. Features of cranial shape distinguish KNM-LH 1 and other Middle and Late Pleistocene African fossils from crania of recent Africans and samples from Holocene LSA and European Upper Paleolithic sites. This estimate is in-between 1.2 and 2.5x10-8, the two most quoted values for this parameter. It seems like such an important number that I'm wondering if it would be possible to brute force estimate it. Maybe people who have whole genomes of parents-offspring should get together and do the mother of all meta-analyses to pin down this number. For example, a recent method for estimating population split times from coalescent rates placed the median split of African from non-African populations at 60–80 ky and the split of Native Americans from East Asians at ∼ 20 ky, both assuming a per-generation mutation rate of 1.25 × 10−8 and an average generation interval of 30 years . [...] Using our inferred rate also makes the dates more recent, but only by a factor of about 1.3 rather than 2, i.e., ∼ 46–61 and 15 ky (with some associated uncertainty both from the model and from our estimated rate), neither of which contradicts external evidence. 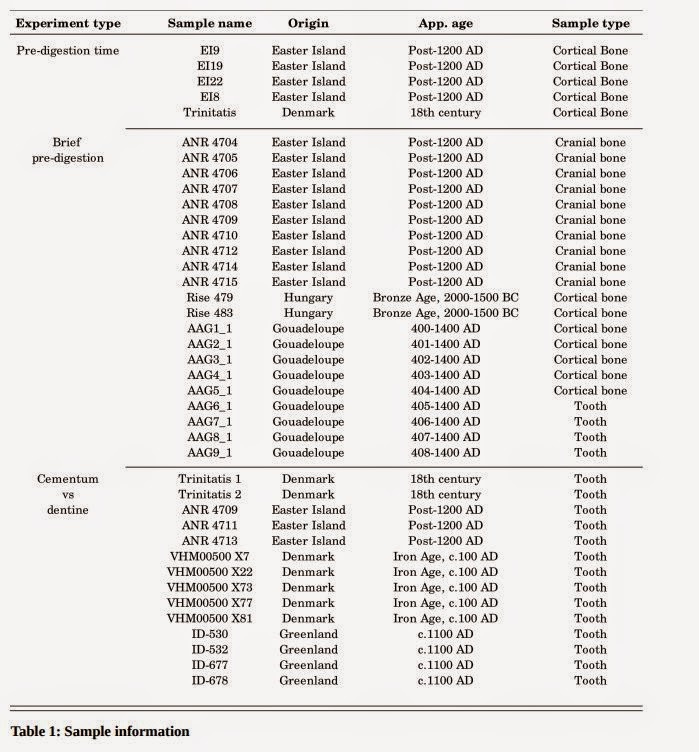 The first of these estimated splits overlaps the dates of estimated Neandertal admixture by the Ust' Ishim and Kostenki papers. For a variety of reasons that I've repeated ad nauseam, I think that the split of Africans from non-Africans first happened about 100ka with Out-of-Africa-into-Arabia. But, if there was back-migration into Africa, maybe this can be brought down. The 15ky value for the East Asian/Native America split seems too young: it's as late as could plausibly maintained for the colonization of the Americas, but the split of the two must have happened some time before that (because the ancestors of Native Americans and East Asians would have split long before a group of them made the crossing into the Americas). The human mutation rate is an essential parameter for studying the evolution of our species, interpreting present-day genetic variation, and understanding the incidence of genetic disease. Nevertheless, our current estimates of the rate are uncertain. Classical methods based on sequence divergence have yielded significantly larger values than more recent approaches based on counting de novo mutations in family pedigrees. Here, we propose a new method that uses the fine-scale human recombination map to calibrate the rate of accumulation of mutations. By comparing local heterozygosity levels in diploid genomes to the genetic distance scale over which these levels change, we are able to estimate a long-term mutation rate averaged over hundreds or thousands of generations. We infer a rate of 1.65 +/- 0.10 x 10^(-8) mutations per base per generation, which falls in between phylogenetic and pedigree-based estimates, and we suggest possible mechanisms to reconcile our estimate with previous studies. Our results support intermediate-age divergences among human populations and between humans and other great apes. Helen D. Donoghue et al. Leprosy was rare in Europe during the Roman period, yet its prevalence increased dramatically in medieval times. We examined human remains, with paleopathological lesions indicative of leprosy, dated to the 6th–11th century AD, from Central and Eastern Europe and Byzantine Anatolia. Analysis of ancient DNA and bacterial cell wall lipid biomarkers revealed Mycobacterium leprae in skeletal remains from 6th–8th century Northern Italy, 7th–11th century Hungary, 8th–9th century Austria, the Slavic Greater Moravian Empire of the 9th–10th century and 8th–10th century Byzantine samples from Northern Anatolia. These data were analyzed alongside findings published by others. M. leprae is an obligate human pathogen that has undergone an evolutionary bottleneck followed by clonal expansion. Therefore M. leprae genotypes and sub-genotypes give information about the human populations they have infected and their migration. Although data are limited, genotyping demonstrates that historical M. leprae from Byzantine Anatolia, Eastern and Central Europe resembles modern strains in Asia Minor rather than the recently characterized historical strains from North West Europe. The westward migration of peoples from Central Asia in the first millennium may have introduced different M. leprae strains into medieval Europe and certainly would have facilitated the spread of any existing leprosy. The subsequent decline of M. leprae in Europe may be due to increased host resistance. However, molecular evidence of historical leprosy and tuberculosis co-infections suggests that death from tuberculosis in leprosy patients was also a factor. An article in the Astana Times. If anyone has any additional information via Kazakh or Scandinavian media, or can find the press release referred to in the article, feel free to share. I could also find this Youtube video from this expedition. Some really rich data in the supplements. The biological behavior of the Y chromosome, which is paternally inherited, implies that males sharing the same surname may also share a similar Y chromosome. However, socio-cultural factors, such as polyphyletism, non-paternity, adoption, or matrilineal surname transmission, may prevent the joint transmission of the surname and the Y chromosome. By genotyping 17 Y-STRs and 68 SNPs in ~2500 male samples that each carried one of the 50 selected Catalan surnames, we could determine sets of descendants of a common ancestor, the population of origin of the common ancestor, and the date when such a common ancestor lived. 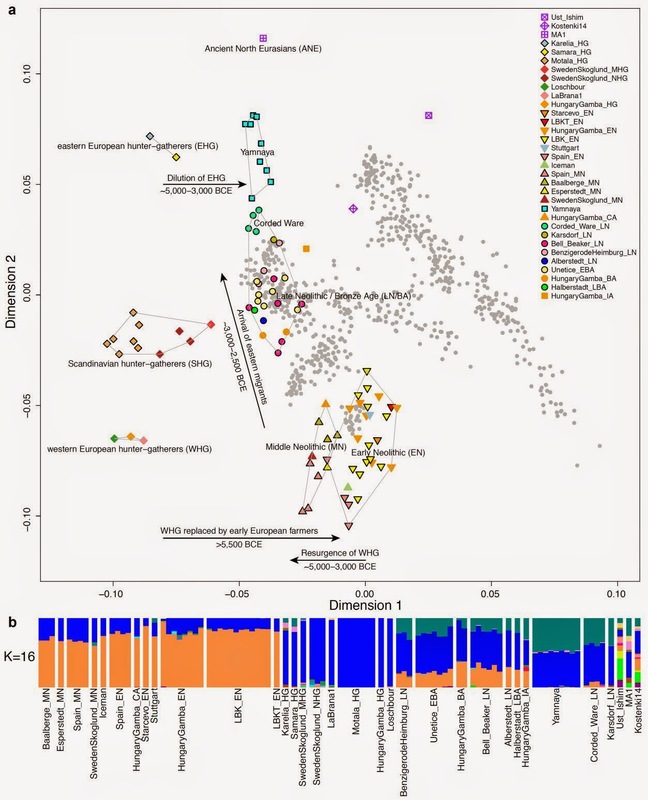 Haplotype diversity was positively correlated with surname frequency, that is, rarer surnames showed the strongest signals of coancestry. 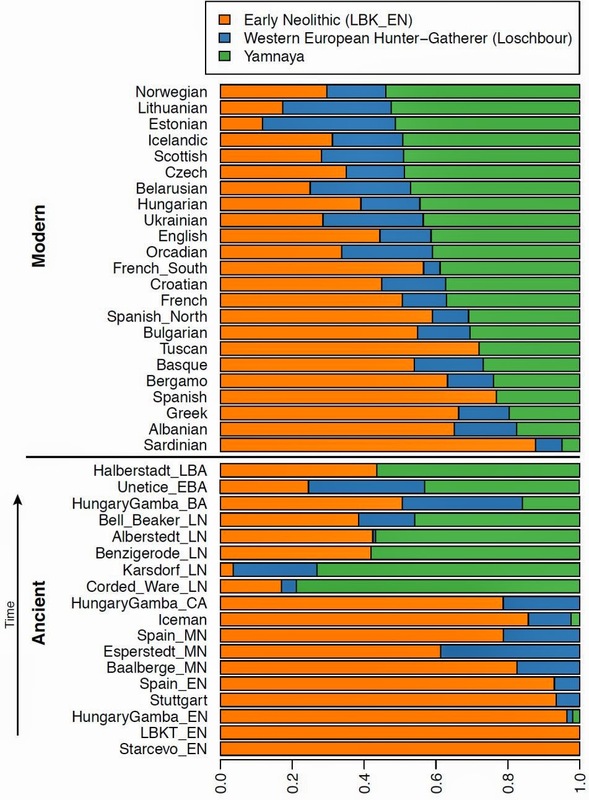 Introgression rates of Y chromosomes into a surname by non-paternity, adoption, and transmission of the maternal surname were estimated at 1.5−2.6% per generation, with some local variation. Average ages for the founders of the surnames were estimated at ~500 years, suggesting a delay between the origin of surnames (twelfth and thirteenth centuries) and the systematization of their paternal transmission. We have found that, in general, a foreign etymology for a surname does not often result in a non-indigenous origin of surname founders; however, bearers of some surnames with an Arabic etymology show an excess of North African haplotypes. Finally, we estimate that surname prediction from a Y-chromosome haplotype, which may have interesting forensic applications, has a ~60% sensitivity but a 17% false discovery rate. As far as I can tell, the hypothesis of "several mixtures" comes from looking at many pairs of populations and seeing that different types of pairs seem like they mixed to make Armenians. Possibility (1) is that Armenians have multiple mixtures, and possibility (2) is that none of the sources work very well. Hellenthal et al. did not find mixture in Armenians, but they worked with a different methodology and smaller sample size. Either, the N=173 sample size enabled detection of this admixture, or differences in methodology account for differences in conclusions. If true, the admixture dates in this paper would be some of the earliest discovered by looking at modern populations (without the help of ancient DNA). 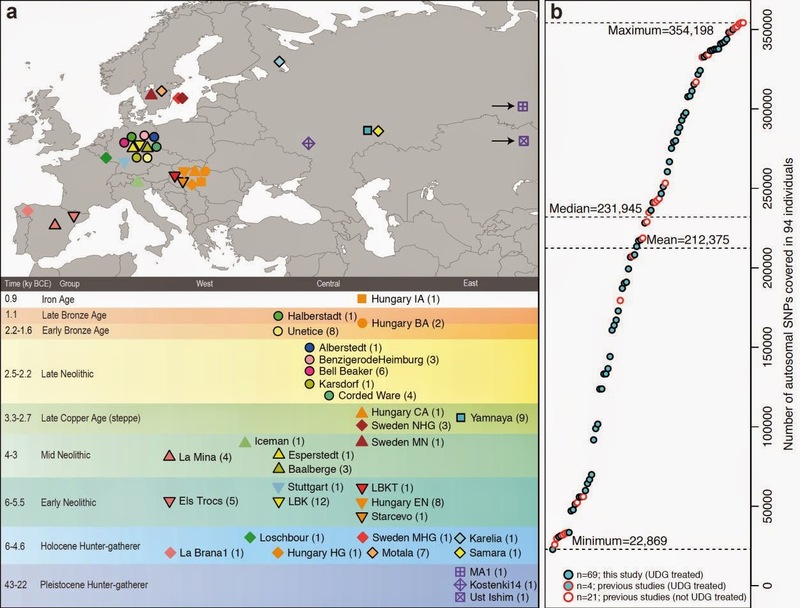 The TreeMix analysis (Figure 4) is inconclusive about admixture from a population best represented by Neolithic Europeans. There is no plot of residuals in this figure, so this model with one migration event may not be adequate. 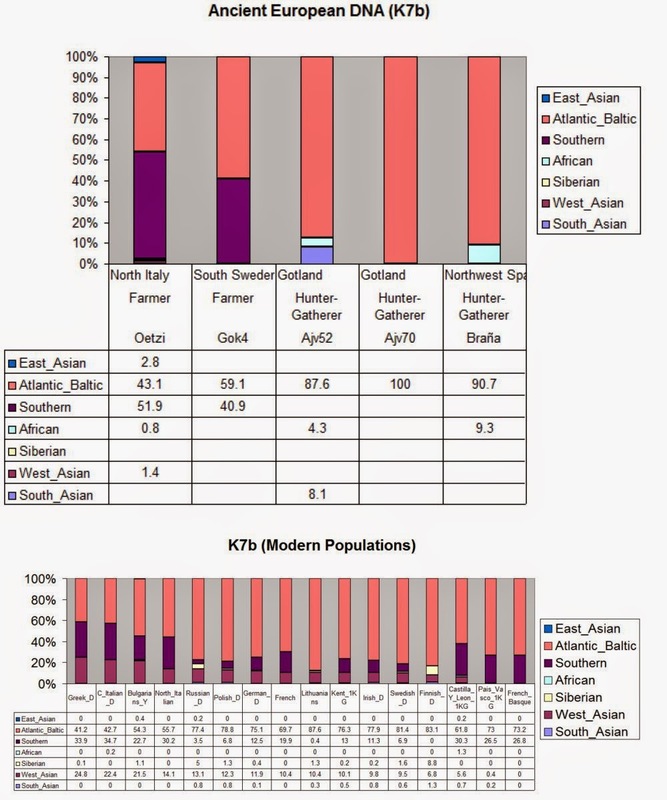 Prior knowledge suggests that it isn't, as Pakistani and European populations have no admixture in Figure 4. It's great that the authors will share their data! As of this writing, the data is not "live"; it might appear when the paper is published. This is the paper that I saw referenced in a previous study. As I suspected, the paper does not in fact provide support specifically for the steppe hypothesis, but only for a late split of Proto-Indo-European (that is consistent with the steppe hypothesis but not unique to it). I don't know how well linguists have figured out how to estimate time depth; the fact that a small tweak in the methodology (compared to Bouckaert et al.) results in a 3,000 year drop in the estimated age of the PIE split does not add to my confidence about the robustness of this field. Regardless of which hypothesis one accepts, the PIE split occurred thousands of years before the first written monuments in any Indo-European language. For the time being, the ball is on the other side of the court, which may accept this finding or come up with another tweak in the methodology that gives yet another date. In any case, accepting provisionally that the Chang et al. date is accurate then it falsifies the Anatolian farmer/IE language hypothesis. So, steppe aficionados can declare a partial victory, because there is one less opponent to worry about. Falsification of the Anatolian first farmer hypothesis is not a complete victory, as the PIE urheimat question is not a boxing match between Kurganists and Anatolianists, but rather a mêlée with many players holding on to their swords. So, if you're willing to believe that the methodology is mature enough and they finally "got it right", you need only find a PIE split around 6,000 years ago, but you need not find it on the steppe. Discussion of Indo-European origins and dispersal focuses on two hypotheses. 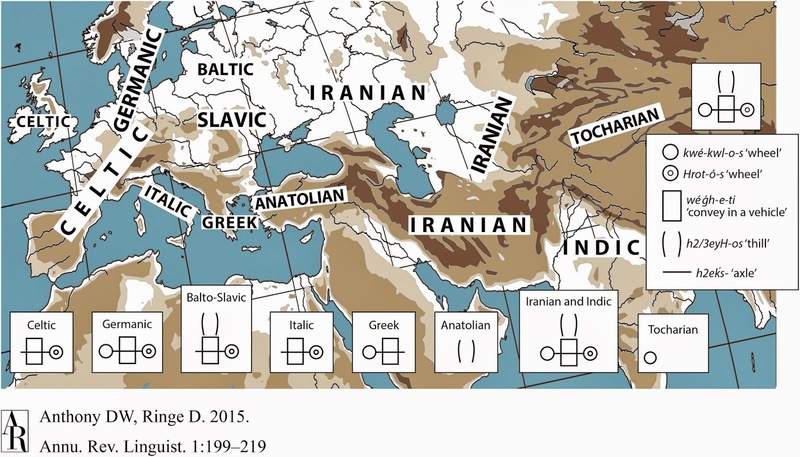 Qualitative evidence from reconstructed vocabulary and correlations with archaeological data suggest that IndoEuropean languages originated in the Pontic-Caspian steppe and spread together with cultural innovations associated with pastoralism, beginning c. 6500–5500 bp. 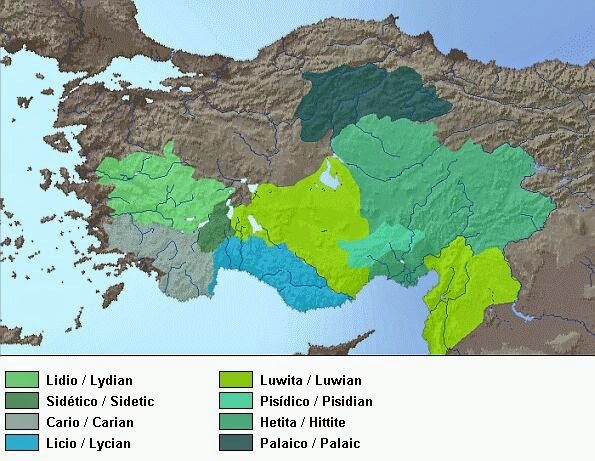 An alternative hypothesis, according to which Indo-European languages spread with the diffusion of farming from Anatolia, beginning c. 9500–8000 bp, is supported by statistical phylogenetic and phylogeographic analyses of lexical traits. 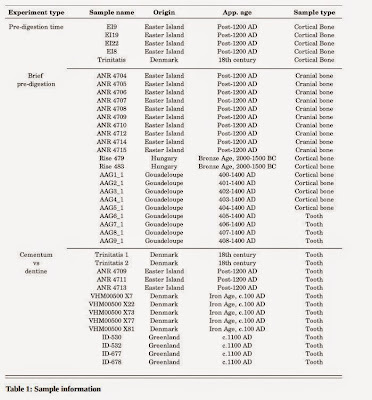 The time and place of the Indo-European ancestor language therefore remain disputed. Here we present a phylogenetic analysis in which ancestry constraints permit more accurate inference of rates of change, based on observed changes between ancient or medieval languages and their modern descendants, and we show that the result strongly supports the steppe hypothesis. Positing ancestry constraints also reveals that homoplasy is common in lexical traits, contrary to the assumptions of previous work. We show that lexical traits undergo recurrent evolution due to recurring patterns of semantic and morphological change. 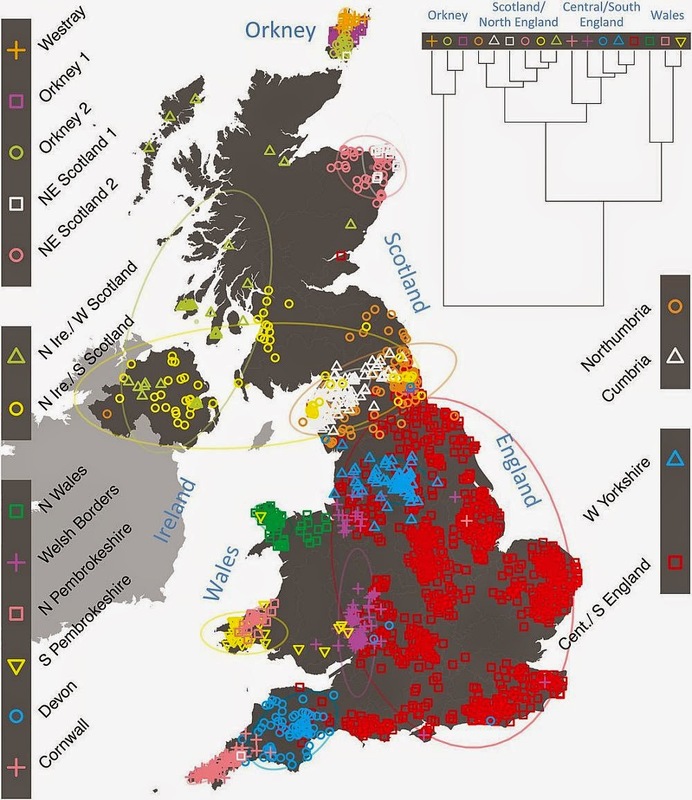 This article is a review that presents a genetic map of the British Isles from an upcoming study by Leslie et al. (2014) that is listed in the references as being "in press" in Nature. This may very well be the big POBI study of the British Isles that has been talked about for years now. From 1900, when Landsteiner first described the ABO blood groups, to the present, the methods used to characterize the genetics of human populations have undergone a remarkable development. Concomitantly, our understanding of the history and spread of human populations across the earth has become much more detailed. As has often been said, a better understanding of the genetic relationships among the peoples of the world is one of the best antidotes to racial prejudices. Such an understanding provides us with a fascinating, improved insight into our origins as well as with valuable information about population differences that are of medical relevance. The study of genetic polymorphisms has been essential to the analysis of the relationships between human populations. The evolution of methods used to study human polymorphisms and the resulting contributions to our understanding of human health and history is the subject of this Perspectives. A new technical paper on the bioRxiv. Of interest is the group of samples, which includes some nice additions, including Bronze Age Hungary, Iron Age Denmark, and Post-1200AD Easter Island. Hopefully, we'll see genomes from these regions soon. Poor DNA preservation is the most limiting factor in ancient genomic research. In the vast majority of ancient bones and teeth, endogenous DNA molecules only represent a minor fraction of the whole DNA extract, rendering traditional shot-gun sequencing approaches cost-ineffective for whole-genome characterization. Based on ancient human bone samples from temperate and tropical environments, we show that an initial EDTA-based enzymatic 'pre-digestion' of powdered bone increases the proportion of endogenous DNA several fold. By performing the pre-digestion step between 30 min and 6 hours on five bones, we identify the optimal pre-digestion time and document an average increase of 2.7 times in the endogenous DNA fraction after 1 hour of pre-digestion. With longer pre-digestion times, the increase is asymptotic while molecular complexity decreases. We repeated the experiment with n=21 and t=15-30', and document a significant increase in endogenous DNA content (one-sided paired t-test: p=0.009). We advocate the implementation of a short pre-digestion step as a standard procedure in ancient DNA extractions from bone material. Finally, we demonstrate on 14 ancient teeth that crushed cementum of the roots contains up to 14 times more endogenous DNA than the dentine. Our presented methodological guidelines considerably advance the ability to characterize ancient genomes.